Cover the bottom of a saucepan with water. Let it all boil. Stir occasionally so it doesn't burn. When it's near completion, season it with lemon. 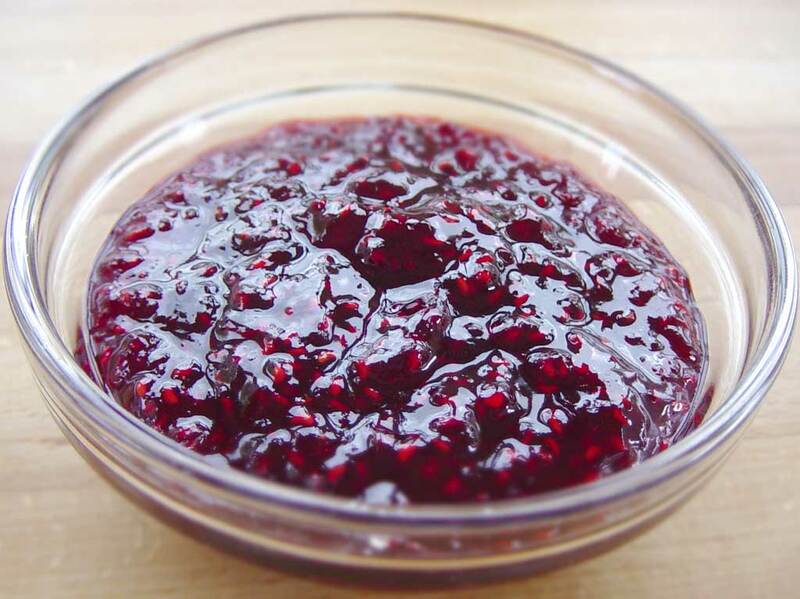 Once the bubbles start connecting on the surface the jam is finished. If you have a cooking thermometer or a sugar thermometer, temperature should be between 103°C and 105°C (217°F and 221°F). The marmalade will be taste most fresh if it's allowed to boil at a relatively low temperature. It's the most gentle to the berries. So it's an advantage to cook it in a pan or in a large saucepan. Though in small portions like this it doesn't make such a big difference. I use a regular sized saucepan. I always use frozen fruit in my marmalade. The local fruit dealer sell it in 300 g bags, hence the recipe size. All right. It actually also fits really well with the quantity needed for raspberry chops. Raspberries softens easily when boiling. Strawberries and other hard fruits I usually chop into 1/4's so there aren't any big lumps. The difference between marmalade and jam is hard to define. It is a strange combination of history and food laws. In Denmark the rules are: According to law there has to be 25% fruit in marmalade and 45% fruit in jam, so jam is "fine-dining". This recipe should really be called "Raspberry - strawberry jam" But I don't think the food police will arrest me for that. The main reason that marmalade is made is because the high sugar percentage conserves the fruit. which will keep it fresh during the winter. But the marmalade also has a texture that sugar and fruit can't achieve separately. Marmalade usually consists of 45% -55% sugar by weight. When the jam is reduced by simmering, up to 2/3 of the weight will be sugar. You could use less sugar in the marmalade, which would make it taste more like fruit, but make preserve worse. In these refrigerator days that's not really such an issue though. It can also be frozen. Marmalade comes from the Italian word marmelatta that comes from the Portuguese word marmelo, meaning quince. It was used on the Greek "melimelon" which is quince marmalade with honey as sugar and preservative. One of the very first marmalades. So Greek quince marmalade is actually the mother of the marmalade we know.